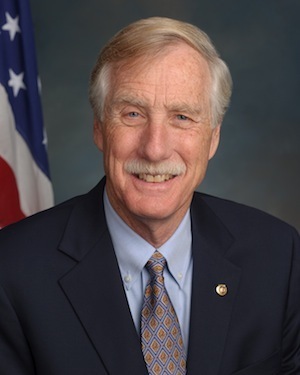 U.S. Sen. Angus King (I-ME), a member of the Senate Energy and Natural Resources Committee, said on Wednesday that he, along with Sen. Martin Heinrich (D-NM), have introduced legislation that would set national targets for energy storage to encourage the development and use of solar and wind-energy systems. The Energy Storage Promotion and Deployment Act would enable electric utilities to meet the energy-portfolio standard with any combination of technologies and ownership, including storage located at homes or businesses. King said that in the all-important shift toward renewable energy sources, storage is the missing link that can help propel the country toward a sustainable and responsible energy future. The bill requires most state-regulated utilities, by the end of 2024, to have sufficient new energy storage available to provide at least 2 percent of the maximum power level they deliver to consumers. A utility may meet the standard with any combination of storage technologies and ownership, including storage located at homes or businesses, and energy storage systems, including thermal storage, used in conjunction with demand-response or time-of-day pricing programs. The concept is similar to the renewable energy standards in many states, including Maine. The Energy Storage Promotion and Deployment Act is modeled on a program in California, which requires three large utility companies – Pacific Gas & Electric, Southern California Edison and San Diego Gas & Electric – to deploy at least 1,325 megawatts of storage by the end of 2024.